In order to launch Apple Pay in the lucrative China market, Apple agreed to halve its normal transaction fee for the country's banks, a report said on Monday. Whereas Apple is thought to claim about 0.15 percent per transaction in the U.S., the equivalent fee is approximately 0.07 percent in China, sources informed Caixin. American merchants can sometimes pay up to 2 percent in overall fees for a card transaction, but in China, the total can be as low as 0.38 percent —making an extra 0.15 percent a comparatively large burden. High fees are believed have been the major resistance point in negotiations during 2015. Apple ultimately announced a deal in December, and launched the payment platform with 19 Chinese banks on Feb. 18, though not all partners are yet live. Sign-up demand was intense enough on Thursday that a number of people ran into error messages when trying to add cards. Traffic has since stabilized. 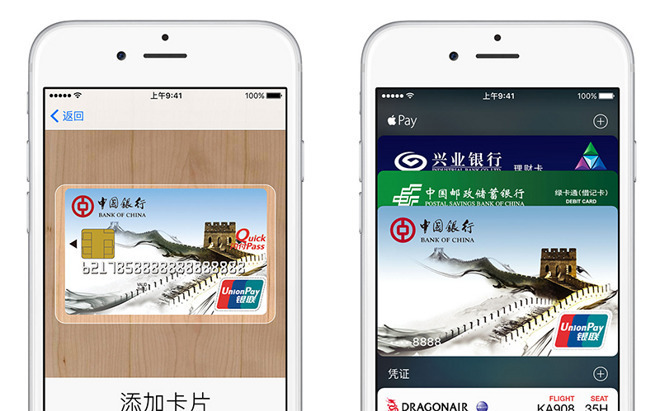 Apple has suggested that China could eventually become the largest market for Apple Pay. The service is currently available in just a handful of regions, the others being the U.S., the U.K., Canada, and Australia. In the latter two countries it can only be used with American Express cards, which aren't commonplace. Spain, Singapore, and Hong Kong are among planned expansions.